I've had so much fun doing the cover illustrations for StephC's Cake Patterns, and now that I'm feeling better, I can't wait to actually sew them for myself! Shown are Pavlova wrap top & circle skirt, Hummingbird peplum knit top and pencil skirt with back flounce, Tiramisu surplice knit dress with chevron stripes. This past weekend I woke up and realized that for the first time since my daughter and I got sick (her with severe asthma/eczema/severe allergies, me with a never-ending serious sinus infection) back in August, I no longer felt overwhelmingly tired and ill and miserable. Wow! I felt like Dorothy in the Wizard of Oz, stepping out of her black & white farmhouse into the Technicolor land of Oz. Instead of every little thing being an effort, I was buzzing with thoughts and ideas and excitement and imagination and just, well, JOY. I had a lovely time at the Colette Patterns party at Brooklyn General (pictures later, I need to get to bed!) on Saturday, and on Sunday I dug through my pattern and fabric stash for inspiration. I've been busy dealing with a closet moth infestation of epic proportions AND I have had to send both my sewing machine and serger to the shop for a tune-up. BOTH of them! Ugh! So in the meantime I am comforting myself with my second-favorite sewing-related pasttime, sketching! I whipped up a little sketch using my croquis of how I might look in the three Cake Patterns out so far, and I'm hoping to get Tiramisu cut out while my machines are at the sewing doctor. The Hummingbird and Tiramisu sketches are based on stash fabric... I'm going to try and sew Pavlova from the stash as well but I have to make sure I have the right fabric for the job. 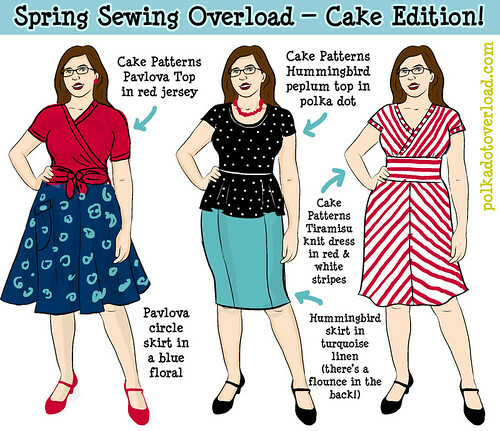 I do have a huge sewing queue of so many different patterns, but I really want to start with Cake as I really want to bring my drawings to life... plus, have you seen the delicious Tiramisus and Pavlovas other people have been sewing? Seriously. I'd vote for Pavlova. I made up two Pavlova sets and I'm absolutely living in the one version (cotton top, easily washable skirt). It's not even making it out of the laundry to be put away with the rest of my clothes, just going right back to being worn as soon as it's clean. That being said, I don't think you can go wrong with any of the three options you have sketched out. Oh, I love your versions... especially that floral/animal print skirt! ha! yeah, I think I will make Tira first, since she was the first one I drew for Cake and because there's less fitting involved than with the pencil skirt. I love that you were wearing yours while you typed that! What a fun lineup! I love that the outfits all kinda go together! So nice meeting you Saturday! Ooh, so inspiring and I'm so glad you're feeling like you again! I think you should make Tiramisu's first too! They are super comfy, and more suited to running after wee kid. I found the Pavlova wrap top a little more trick to match with just the right fabric for it to be comfy! First off, it was great meeting you on Saturday. What a great event. Sorry about your closet moths. Must be frustrating! Good luck getting that resolved. Your croquis are so cool. I guess I'll jump on the bandwagon and suggest making Tira first. I love mine to death. I'm so looking forward to receiving my Hummingbird pattern. Continue feeling better. Take care and see you during Me Made May and hopefully more local events. I love your drawings - You're so talented! I'm excited to see the linen hummingbird skirt, although, as far as I know, the pattern hasn't shipped yet... unless you already have an advanced copy, in which case, I'm super jealous. Oh, so glad you're feeling better! And I always love your drawings. I am excited to sew up Hummingbird and I wouldn't mind another Tira myself.